Federal authorities have arrested a man in connection to the suspected explosive packages discovered this week, multiple law enforcement sources tell CNN. No information was immediately available about the suspect. Earlier Friday, authorities intercepted suspicious packages intended for Sen. Cory Booker and former Director of National Intelligence James Clapper. The packages are the latest to be sent to prominent Democrats and critics of President Donald Trump that were discovered earlier this week. The FBI said Friday that the package addressed to Booker, a New Jersey Democrat, was discovered in Florida and is “similar in appearance to the others.” Sources told CNN the package was addressed to the senator’s Camden, New Jersey, office. Booker confirmed the package was intended for him but declined to comment further to CNN. 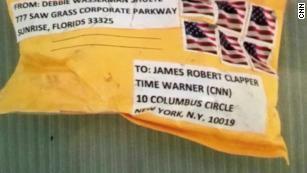 The package arrived in a manila envelope with six US flag stamps, similar to other packages discovered this week. The return address is that of Florida Democratic Rep. Debbie Wasserman Schultz’s Florida office, which was the address on packages intended for former President Barack Obama, former Vice President Joe Biden, billionaire and Democratic donor George Soros, actor Robert De Niro, former Attorney General Eric Holder, 2016 Democratic presidential nominee Hillary Clinton and former CIA Director John Brennan. There is no information that suggests Wasserman Schultz sent the packages. Trump was being briefed on the latest developments Friday morning, White House press secretary Sarah Sanders said. As the situation unfolded, the President tweeted about illegal immigration, a key campaign issue he’s highlighted ahead of the midterm elections. Speaking at the Justice Department Friday morning, Attorney General Jeff Sessions said various agencies, including the FBI and Secret Service, were “working tirelessly” to investigate the packages. “I can tell you this: we will find the person — persons responsible, and we’re going to bring them to justice,” Sessions said. A Justice official told CNN that Sessions canceled a trip to Louisiana scheduled for Friday to ensure that all resources, such as his plane and personnel required for his travel, would be available for the ongoing investigation.